A wood fired sourdough pizza base topped with a Parmigiano Reggiano full fat hard cheese and porcini mushroom white sauce, mozzarella full fat soft cheese, rostello ham, garlic portobellini mushrooms and mascarpone full fat soft cheese. A hand stretched sourdough base with creamy parmesan and porcini sauce, rostello ham, garlic mushrooms and mascarpone. We select the freshest ingredients to give our pizzas flavour. 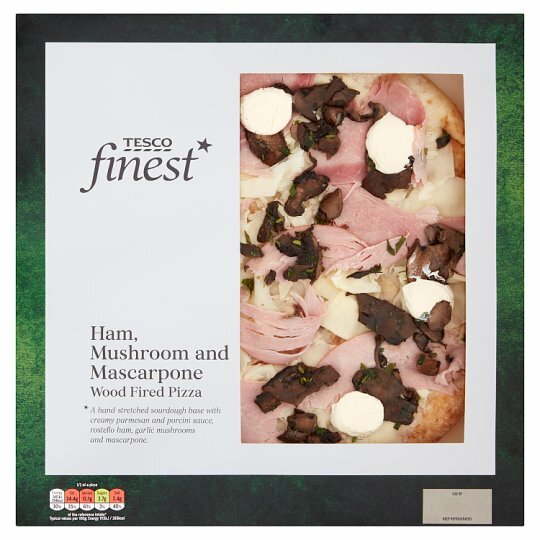 Here we use a rich white sauce, with parmesan and porcini mushrooms, to complement a topping of mozzarella, succulent rostello ham and garlic roasted portobellini mushrooms in parsley, It's all brought together by creamy mascarpone. Our base is made from fine 00 flour and sourdough starter, slowly fermented to give a crisp, 'eggshell' crust. It’s then expertly hand stretched and baked in a wood fired oven for charred pockets of flavour. INGREDIENTS: Wheat Flour (Wheat Flour, Calcium Carbonate, Iron, Niacin, Thiamin), Water, Mozzarella Full Fat Soft Cheese (Milk), Rostello Ham (8%), Portobellini Mushroom (7%), Whole Milk, Mascarpone Full Fat Soft Cheese (Milk) (6%)(Cream (Milk), Rapeseed Oil, Whipping Cream (Milk), Semolina (Wheat), Extra Virgin Olive Oil, Parmigiano Reggiano Full Fat Hard Cheese (Milk), Cornflour, Sourdough Culture, Salt, Parsley, Yeast, Lemon Juice, Sunflower Oil, Garlic Purée, Porcini Mushroom Powder, Butter (Milk), Black Pepper, White Pepper. Rostello Ham contains: Pork, Salt, Sugar, Antioxidant (Sodium Ascorbate), Preservative (Sodium Nitrite), Onion Extract, Black Pepper, Garlic Powder, Fennel, Rosemary, Nutmeg, White Wine, White Wine Vinegar. Instructions: From chilled: 220°C / Fan 200°C / Gas 7 10 mins Place pizza directly onto top shelf of a pre-heated oven with a tray on the shelf below, for 10 minutes. Instructions: From frozen: 200°C / Fan 180°C / Gas 6 16 mins Place pizza directly onto top shelf of a pre-heated oven with a tray on the shelf below, for 16 minutes.